The inside is simple, well laid out, and relatively spacious. Parking was simple, with free angle parking right in front. 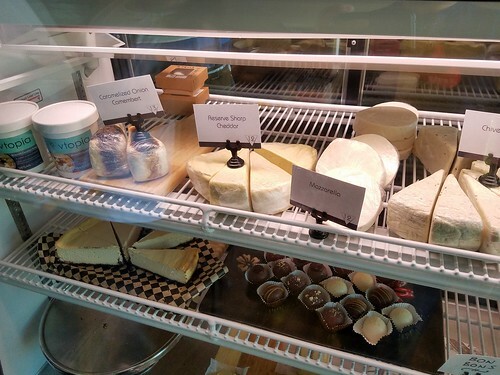 You are immediately greeted with a deli case of all their cheeses to take out, or you can order lunch from their menu. 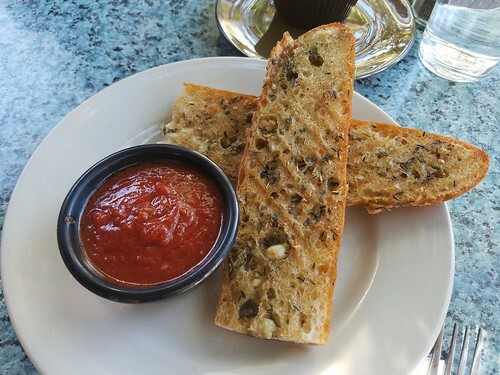 We started with the Garlic Bread with marinara, and added a side of beer cheese. The bread was perfectly broiled, with little garlic chunks peppered throughout. The marinara was deece but the beer cheese sauce was where it was at. Super flavorful, warm, and lended a great texture to the bread. I chose a panini sammich from their impressive variety of “handhelds.” My choice was was the Camembert Bacon, with Vtopia’s macadamia and cashew Camembert with seitan bacon (they use Upton’s), arugula, tomato, housemade mayo, and dijon mustard. 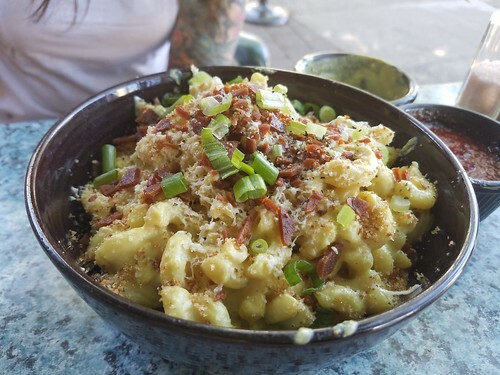 The mac and cheese came out in a massive bowl, steaming and begging you to dig in. The sauce had a traditional mac and cheese flavor which was really good. It was not traditional in the sense of the stringy, melty goodness mac and cheese, and I was totally OK with that. Which leads me to a diatribe. In my opinion, Vtopia is squarely in the second camp. The mac and cheese had a GREAT flavor to it and it still seemed like a healthy (albeit hearty) lunch. My sandwich was the bomb. 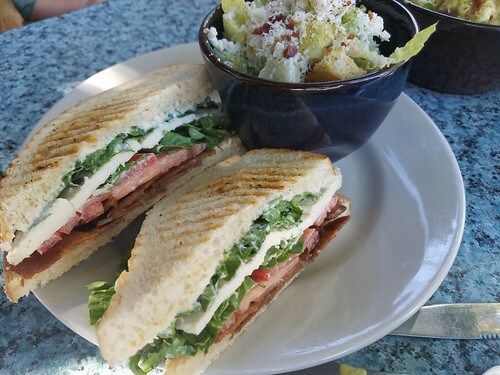 The bread was perfectly toasted, and it had just the right amount of cheese – bacon ratio. I never had dairy Camembert cheese, so I have no baseline. But I will say it was really good. Their cheese had a sublety to it, and I appreciate that. I do remember a lot of cheeses can overpower an entire sandwich, and this was not the case. 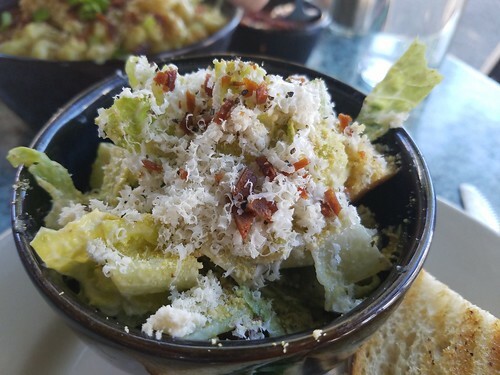 My $3 additional Caesar salad was good, but the up charge seemed steep for a tiny side salad. We decided we couldn’t have lunch at a vegan cheese establishment and NOT try a piece of cheesecake. So we popped on a slice of strawberry which is apparently their standard cheese cake just with strawberry sauce on it. 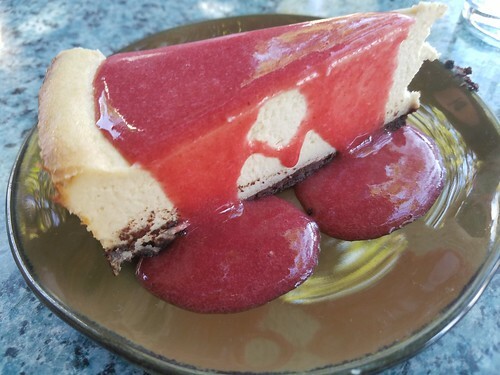 The cake was surprisingly firm – not in a bad way, but different from some of the other vegan cheesecakes I have tried. The cake was good, but the sauce seemed to be on the blander side, offering little strawberry flavor. The service was top shelf, warm, and friendly. Food was delivered promptly and was presented beautifully. 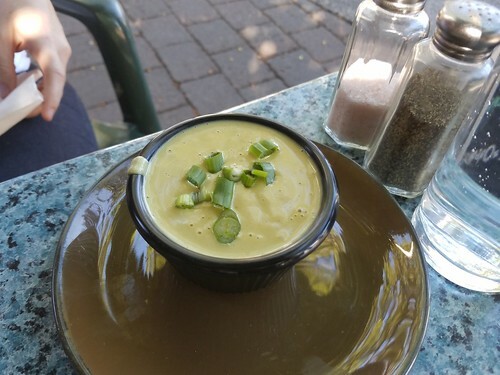 If you are ever in NW Portland, you need to swing into Vtopia for lunch. And bring home some cheese!